agreed. It's even worse then that they seem to use building codes as gentrification tools down there. I would like to see when those ruined concrete structures were built. 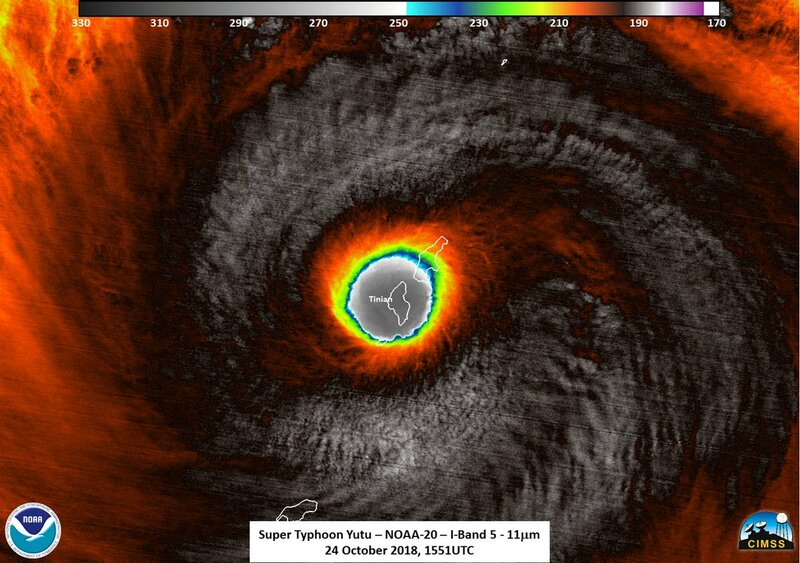 Modern Hurricane standards are less then 20yrs old. Your dome structures would survive for sure. Sound post apacalyptic imagine the real estate ads for a ruined world. "Bermed structure to resist the highest surge. Fully integrated powered storm shutter doubles as effective crowd control, lab tested to level5a hurricane, deployable solar array for emergencies, water purifacation system... it become almost like terraforming only on a hostile earth not a far away planet. lol. One of these days I'll have to show you my design for a fortified housing system made from Monolithic Domes and Steel Conex containers. I read your post and didn't even know what ICF was. So I looked it up. Fascinating AF. You should write a blog about that. I bet it won't be a Trump Golf Course! "Please Help Me Find My Son," one mother wrote in a Facebook group that was set up to locate missing people during disasters. 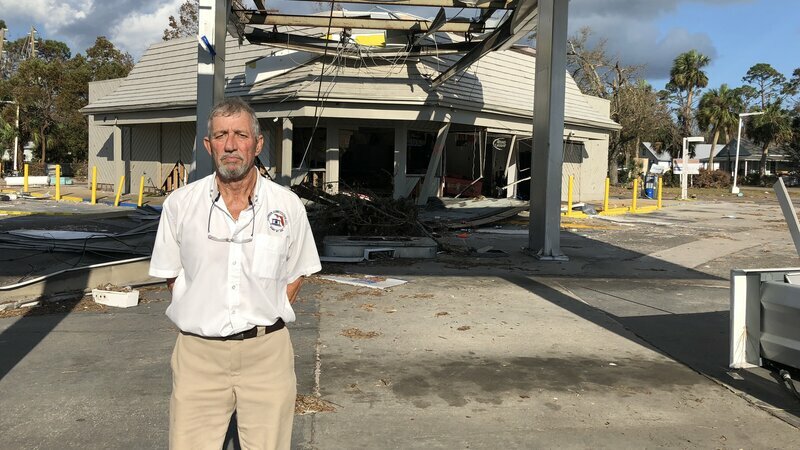 Keith Douglas' family has been trying to reach him since last Wednesday, when Hurricane Michael directly hit Panama City, Florida, where he lives. He had decided not to evacuate, and his sister, Mandy Robinson, wanted to make sure he'd weathered the storm. But every time she called, all she heard was beeping. Robinson grew even more frantic to reach Douglas on Saturday, when their brother, Mark Bonner, 48, died unexpectedly of congestive heart failure. Bonner's funeral is Tuesday in LaGrange, Georgia, and Robinson knows that Douglas would want to be there. But she still hasn't been able to reach him. "I don't want him to not know about it," said Robinson, 44, who posted on Facebook to ask if anyone had seen or spoken to her brother. "We've tried everything. No one has heard from him." 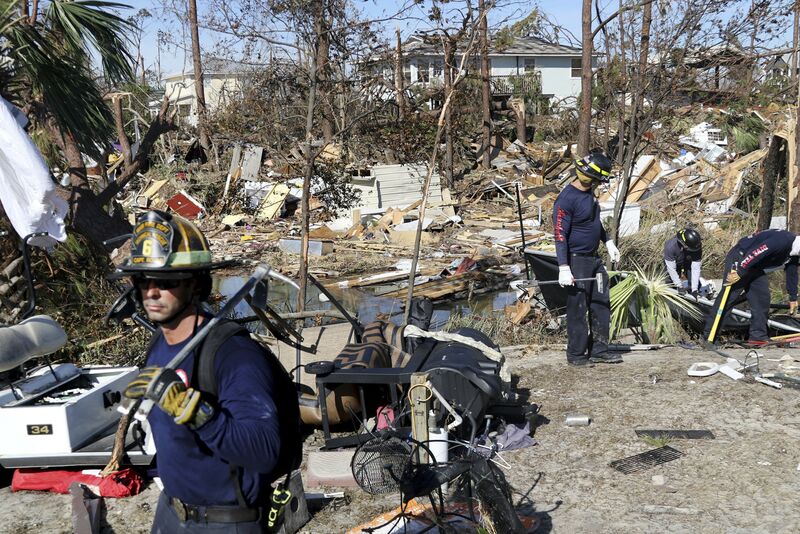 Five days after Hurricane Michael devastated beach towns in the Florida Panhandle, search-and-rescue teams are still combing through rubble in search of hundreds of people reported missing. As of Sunday night, authorities said that 250 people who had chosen to stay behind were unaccounted for. It's too soon to say what happened to those who are missing. Nearly 200,000 Floridians still don't have electricity, and some areas are without cellphone service, which could be preventing people from reaching out for help. In the absence of official information on their loved ones, dozens of relatives who live outside of the hardest-hit areas are turning to social media to fill in the gaps. "Please Help Me Find My Son," Kristine Wright wrote Saturday in a Facebook group that was set up to locate missing people during disasters. Wright and her husband, Robert Perry, who live in Freeport, Florida, have been anxiously trying to reach their son Nicholas Sines, 22, who lives in Panama City and didn't plan to evacuate. Wright and Perry had been driving about 60 miles each day to Panama City in an attempt to reach their son's home, but each time they were rebuffed by authorities who told them the area was not safe to enter. They had reached out to rescuers, but there were no updates. So the post with photos of their son in the Facebook group, Hurricane Michael: Missing & Separated Resources, was a last-ditch hope. 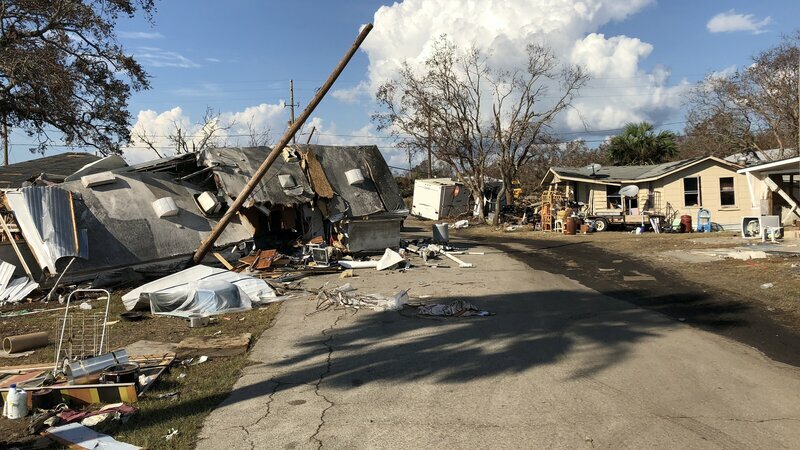 On Monday afternoon, Erica Rodgers, a resident of Panama City Beach, wrote that she would check on Sines. No one answered the door of his apartment, Rodgers said, but Rodgers told Wright that neighbors had seen him on Sunday and he was fine. “I can’t believe she got to Nick’s apartment,” said Wright, who was glad for the news but still worried. “I hope and pray that it really was him who the neighbors saw." Rodgers, 33, said she had checked on two other residents of the area for family members on Facebook after returning home to Panama City Beach on Monday and finding her waterfront property virtually untouched. "We were very, very fortunate," Rodgers said. "That's why I wanted to help those who were in need." The Facebook group where Rodgers and Wright connected was created last year by Tara Holmes, a Florida resident, after Hurricane Harvey hit Houston. With each new storm, the group grows. "Sometimes it takes a disaster to bring people to work together," Holmes said. Another person who posted in the Facebook group was Danielle Garone. She last spoke with her aunt, Agnes Vicari, 79, on Wednesday when Vicari was boarding up her Mexico Beach, Florida, home of 30 years after receiving a mandatory evacuation order. Mexico Beach was "wiped out" in the storm, Brock Long, head of the Federal Emergency Management Agency, said during a press conference one day later, calling the beach town "ground zero." Garone, who lives in Miami, has struggled to piece together what happened to her aunt. An Oct. 13 Tampa Bay Times article reported that an elderly woman named Agnes was airlifted out for medical assistance, but when Garone reached out to the Coast Guard, hospitals and shelters, no one was able to confirm that they'd seen her aunt. "It has been an absolute whirlwind trying to get any sort of information," Garone said. "We don't know if she is alive or if she is buried underneath something." While the Facebook group hasn't turned up any solid leads, Garone is glad more people are seeing her aunt's photo and information. "More than anything I am surprised by the amount of backing and support we have been getting from absolute strangers on Facebook and Twitter," she said. Michael: The Path of Total Destruction now UP on Global Economic Intersection! The sheer impact of the recent trade war has pushed gold beyond its capabilities as a safe-haven asset. The metal has been thrashed in the first half of the year but has rallying potential thanks to number of market factors. This map shows the projected path of Hurricane Willa on Oct. 22, 2018. Threatening a major tourist resort area, the storm landed near Isla del Bosque in Sinaloa with winds of 120 mph, the National Hurricane Center (NHC) said during a special 7 p.m. MT advisory. Hurricane Willa made landfall on Mexico's Pacific coast on Tuesday night as a powerful Category 3 storm. Threatening a major tourist resort area, the storm landed near Isla del Bosque in the state of Sinaloa with winds of 120 mph, the National Hurricane Center (NHC) said during a special 7 p.m. MT advisory. Willa came ashore roughly 10 miles south of Escuinapa, and roughly 50 miles southeast of Mazatlan, a resort city that's home to high-rise hotels and about 500,000 people, including many U.S. and Canadian expatriates. 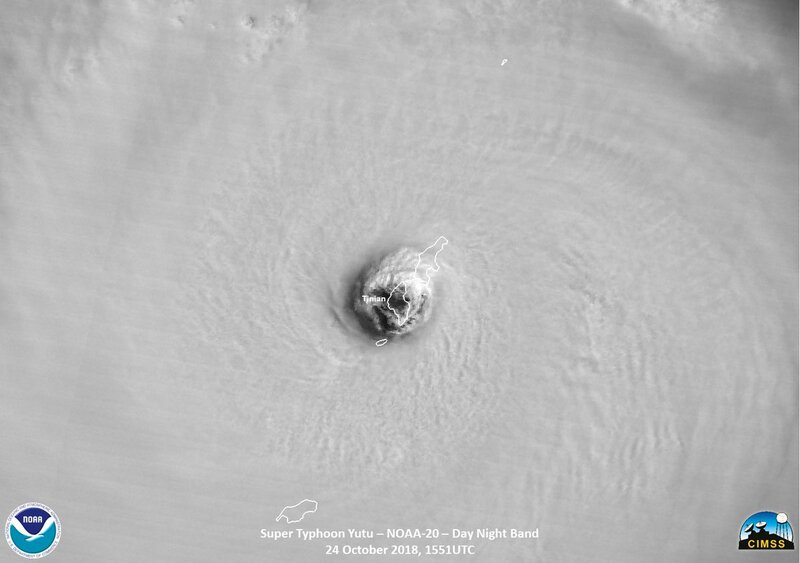 Forecasters warned those in the area to "not venture out into the relative calm of the eye" because dangerous winds in the area "will suddenly increase as the eye passes." Torrential rain in the area began Tuesday afternoon. Emergency officials said that more than 4,000 people were evacuated from coastal towns and close to 60 shelters were set up before the storm. Hurricane Willa made landfall near Mazatlan, Mexico on Tuesday night as a powerful Category 3 storm. Willa, according to forecasters, could bring 6 to 12 inches of rain, with up to 18 inches in some places, to parts of Jalisco, Nayarit and Sinaloa states, with flash flooding and landslides possible in mountainous areas. Hurricane Willa may be gone, but some of its remnant energy and moisture will help fuel the first nor'easter of the season for the East Coast this weekend, the National Weather Service said. Power outages, travel delays, flooding, rough surf and widespread "miserable conditions" are all likely from the storm, AccuWeather said. Rain and wind will spread up the East Coast Friday through Saturday night or early Sunday, weather.com said. 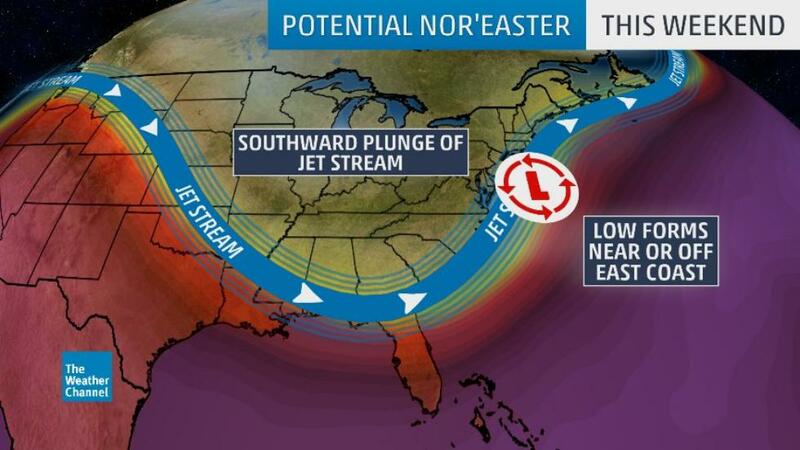 The worst weather will be from from Virginia to Maine. "At this time, it looks like this storm will bring a general 1-2 inches of rain and a period of 40- to 50-mph wind gusts to the coast," according to AccuWeather senior meteorologist Dave Dombek. Nor'easters – named for the direction from which their winds blow – are most common from fall through the early spring. In the heart of the winter, they can become notorious powerhouse snowstorms, sometimes delivering a crippling blow to the big East Coast cities. Since it's only October, however, most of the precipitation that falls this weekend will be rain, so snow shovels won't be needed for most folks. Some of the higher elevations of northern New England and the interior Northeast could see some wet snow from the storm. 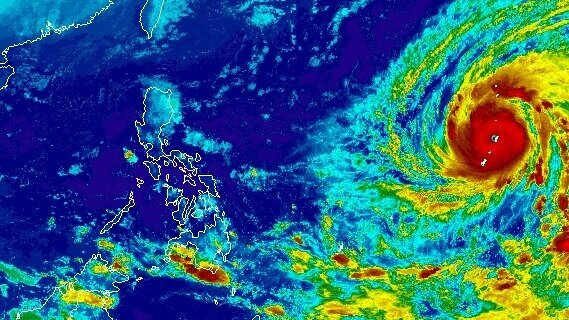 The combination of rain, wind and a low cloud ceiling is also likely to lead to airline delays and slow travel on area highways, AccuWeather said. Even before the nor'easter lashes the East Coast, the South will see a soggy couple of days as the remnants of Willa merge with other weather systems. After a rainy day Wednesday in waterlogged Texas, the heaviest rain Thursday will be along the Gulf Coast from Mississippi to Florida. "The downpours will expand eastward along the central Gulf Coast by Wednesday and Thursday, and eventually target areas of the Florida Panhandle and Georgia that were ravaged by powerful Hurricane Michael," AccuWeather meteorologist Kyle Elliott said. Willa hit the mainland near Isla del Bosque, Mexico, which is about 50 miles southeast of the tourist town of Mazatlan.